Since the dawn of our current console generation, consumers have either had to walk the path of Sony’s Sixaxis/DualShock 3, or become devoted to teaching the holy word of the Xbox 360 controller. Both pieces of hardware excel in their own, unique areas, but the triggers found on Microsoft’s device, coupled with the placement of the analog sticks, have helped it become the ideal choice for modern shooters. Quickly pulling up the scope for a perfect headshot just feels right on the 360’s wireless controller – a sensation not often replicated on the PlayStation 3 due to the placement of the DualShock’s shoulder buttons. Thankfully, third-party manufacturers like Nyko have been given the freedom to tinker with Sony’s design. The Raven wireless controller may preserve the rumble, motion control and slick, black coating found on standard PS3 controllers, but the intuitive layout of the buttons allows for a different playing experience. The Alternate model (pictured above) mirrors the offset analog sticks found on an Xbox 360 controller, while the angled triggers prevent even the sweatiest of fingers from slipping during heated gunfights. Not all the buttons press or click as well as you’d like, but this sturdy, cost-effective substitute to the leading model is worth a look for multiplayer enthusiasts. As you’d hope, the core tenets of the DualShock 3 are all here. The Raven rumbles when it should, responds to the motion of your hands and, most importantly, fits like a glove. This is a sturdy, comfortable device that won’t break from a rage-induced spike, and the textured finish is a pleasant adjustment from the smooth feel of the average PS3 controller. Everything from the D-pad to the overall weight feels right, and that’s crucial during extended gaming sessions. The angled triggers stand as the greatest enhancement, and a simple switch located on the back allows the L2 and R2 triggers to act as the L1 and R1 buttons. For first-person shooters, this is just what the doctor ordered. The face buttons, on the other hand, aren’t as responsive as they should be. There’s a “mushy” nature to the keys that lack the sensitivity required for most competitive games. For single-player titles, this isn’t much of an issue. Yet, having your gun’s reload delayed by even a second due to an unresponsive button can lead to a quick, inopportune death. These issues rarely cause a great deal of frustration, but it’s an unfortunate downside to an otherwise slick contraption. Even if their placement feels just right, the concave sticks aren’t exactly perfect, either. I occasionally found my thumbs slipping off the slick material after clicking in the right stick to sprint, though their indentation did help to keep me in place more often than not. However, the deadzone is minimal, so your on-screen character will move when, and where, you want him to move. 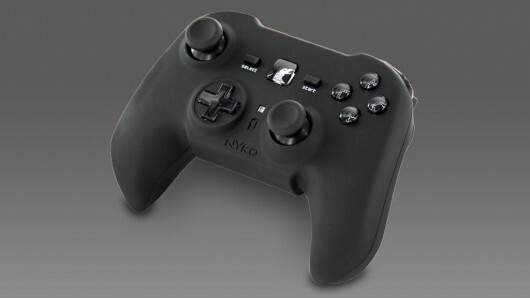 It’s not true gaming bliss, but Nyko’s Alternate Raven PlayStation 3 controller is a solid third-party option for more competitive players. Its 25-hour charge and impressive range make it a dependable device, while the shooter-centric design will give Call of Duty fanatics the competitive edge they’ve been looking for. If you’re happy with what Sony has to offer, there’s little reason to deviate now. But, consumers looking to blaze a new trial should take note of Nyko’s $34.99 Raven. The Raven was developed by Nyko. A review unit was provided by the company for review purposes.